Nice 3 bedroom with self contain boys quota for sale at a good price. Is situated in 1 and half plot and in a dry land and well developed area. 2Bedroom Into Four Units And Twin Duplex Of 4Bedroom Flats Seated On Two Plots Of Land In This Fenced Compound. ...Of 3 Bedroom And 1 Unit Of 2 Bedroom With Nice Finishings All On 2 Plots Of Land. Fenced And Gated. Located Off Otiotio Road, Yenagoa, Bayelsa. 4 Units Of 3 Bedroom Flats For Sale At Okaka Housing Estate, Yenagoa Bayelsa State. 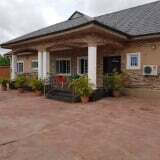 Semi-Detached 6Bedroom Duplex, All Master Bedrooms. World Class Facilities. World Class 5Bedroom Bungalow, All Master Bedrooms With Quality And World Class Facilities.